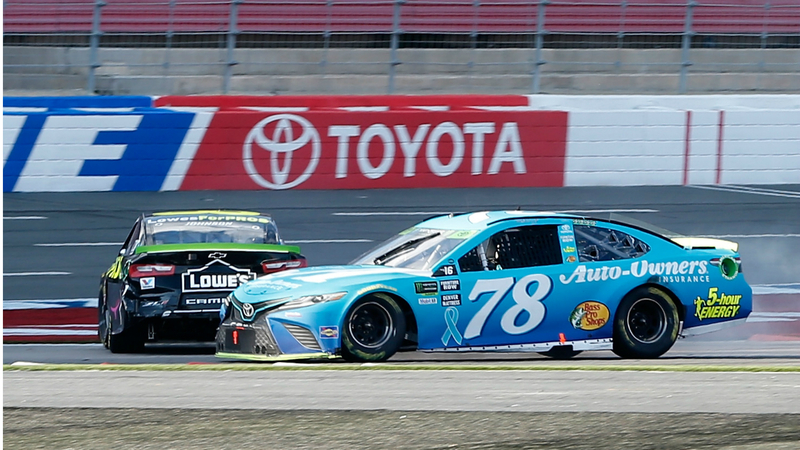 CONCORD, N.C. — Neither Martin Truex Jr. nor Jimmie Johnson needed victory as they fought for first place in the Roval 400 at the Charlotte Motor Speedway on Sunday. Truex Jr. had already clinched NASCAR Cup Series advancement, and Johnson didn’t require a win to reach the Round of 12. Still, they pushed each other down a final stretch chicane that Truex Jr. cautioned Friday could mangle careless cars. Sure enough, Johnson spun out and Truex Jr. lost control trying to avoid the veteran, which let Ryan Blaney claim an unlikely victory from his spot in third place. The crash knocked Johnson out of the playoffs via tiebreaker. Truex Jr. — angry about the finish — rear-ended Johnson after the race was over. In all, the first-ever road and oval combination course provided plenty of buzz for a sport that had one of its worst-ever TV ratings last week in Richmond. Johnson, a seven-time champion, did not look back on the race quite as fondly. Despite lagging behind for much of this season, the most decorated active NASCAR driver had a chance to move on to the next round before his late lapse ended his campaign. As Johnson prepared to face the media following the race, he yelled an expletive to himself. Later, he tweeted an apology to Truex Jr. for how the contest concluded. Truex Jr. was also dejected after the race. He won at the Charlotte Motor Speedway in 2017 and felt good about his chances down the stretch Sunday. ”Johnson just over drove it and was never going to make it and used me as brakes and turned us both around,” Truex Jr. said. “We could have raced side-by-side off the last corner for a win and that would have been cool. Instead of Truex Jr. celebrating another win, Blaney capitalized on the crash with a first-place finish he had difficulty explaining. It’s unclear what kind of long-term repercussions the wild finish and Roval experiment as a whole will have on NASCAR. Smith lauded the new-look course as a refreshing change for the sport, and he said the ending presented a much-needed viral moment. But Roger Penske, Blaney’s car owner, acknowledged losing Johnson this early in the playoffs was a hit to the competition given Johnson’s historic success. This likely isn’t the last Roval race — Truex Jr. said he’s sure there will be more road-oval combination races going forward regardless of his personal feelings toward the course. Others agreed.